As quarry slabs are large, off-cuts can be sizeable too. 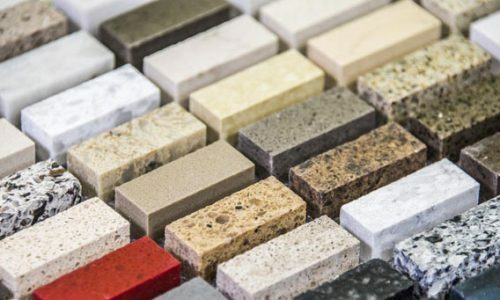 If you want to create a smaller stone worktop, for example for a bathroom vanity, then off-cuts can be an affordable way to get very high quality beautiful stones. Creating coordinating shelves from the off-cuts created when your kitchen worktop was formed is a great way to use up leftover stone, add useful storage to your kitchen and create a complete look. Stone floors don’t have to be dull, and one way to brighten them up is by using multiple stones. Off cuts can be used as accent colours or to create a mosaic effect. The smaller pieces are also a great way to provide a visual break, for example at a doorway, or to disguise the natural variation between two slabs by creating a band of a contrasting colour between them. The smallest off-cuts can rarely be re-used and may be given away for free by granite companies. Brightly coloured and oddly shaped lumps of processed or natural stone are a great way to add a splash of colour and interest to a rockery or garden feature. Off-cuts typically won’t have been finished or polished so even the more unusual colours, such as pillarbox red or egg yolk yellow, will mellow and look almost natural in the garden. Where do off-cuts come from? Cutting out a granite kitchen worktop or a marble bathroom counter leaves waste stone. It’s like cutting out pieces of cloth to make a dress, or paper to wrap Christmas gifts: quarries provide stone slabs in standard sizes designed to be large enough to cover most uses. Granite companies fit the template for an individual piece to the slab and cut to match, creating a perfect worktop and a few odd shapes left over: off-cuts, made of the same high-quality stone.